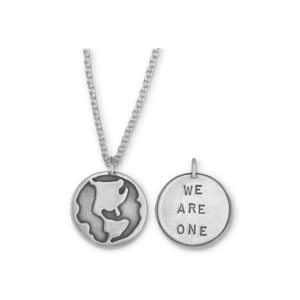 "We Are One" Sterling silver. "WISH" - star charm Sterling silver and 22kt gold plated brass. "With God All Things Are Possible" Sterling silver and 22kt gold plated brass. "Remember that you are loved." -Evelyn McCormick (Reversible! Quote on one side - design on the other) Sterling silver. Your wings exist, all you have to do is fly Sterling silver and 22kt gold plated brass. "Move And The Way Will Open" Sterling silver and 22kt gold plated brass.